When Columbia, S.C. was identified as a leading total eclipse viewing destination, Merritt McNeely, then marketing director at the S.C. State Museum, galvanized regional officials and tourism experts to form a steering committee and create a massive campaign to raise awareness of the region, not only for eclipse visitors, but to encourage year-round tourism as well. The steering committee was comprised of representatives from the South Carolina State Museum, the Experience Columbia SC destination marketing organization (DMO), the City of Columbia, One Columbia for Arts and History, the Columbia Fireflies and the Capital City Lake Murray Country tourism authority. 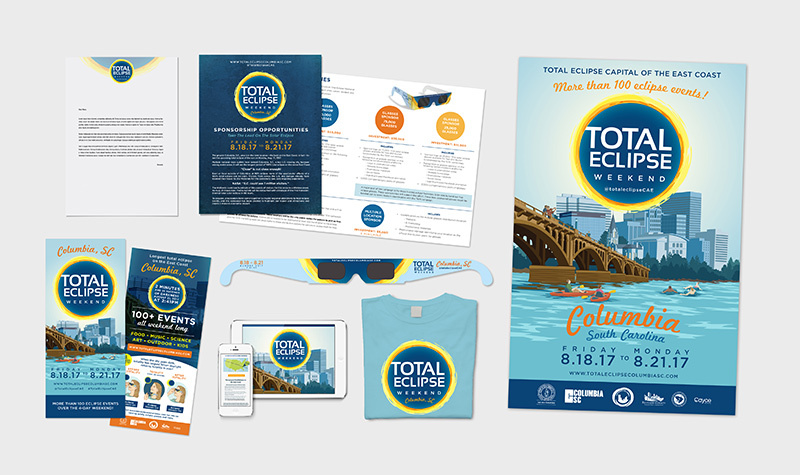 With Flock and Rally at the helm for creative services and integrated communications, the Total Eclipse Weekend Columbia, S.C. campaign was developed to reach travelers across the East Coast and beyond. It is estimated that roughly 400,000 visitors traveled to and within the Midlands region to view the total solar eclipse, and economic impact is estimated at $48 million for Richland County alone. The Total Eclipse Weekend Columbia, SC campaign won the Best in Show Mercury Award at the 2018 Mercury Award ceremony, hosted by the South Carolina chapter of the Public Relations Society of America.